"Your Care Is Our Mission"
using advanced technology to Improve Quality of Life. Nephrology and Hypertension has been serving the community since 1973 and provide a full range of clinical services. We specialize in treatment of acute and chronic renal disease which also includes hemodialysis and peritoneal dialysis care at Reliant Renal Care, Fersenius Medical Care and Davita Dialysis Centers. We also manage difficult to control hypertension (blood pressure), Lupus, electrolyte disturbances and Autoimmune Disease related Nephropathy. Our offices are conveniently located in Flint and Grand Blanc (Genesee county), Lansing (Ingham county), and Owosso (Shiawassee County). Our physicians and staff take great pride in treating our patients with high quality care, compassion and respect. 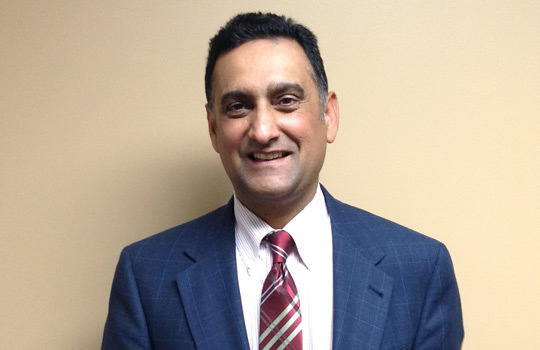 Dr. Grewal has been with the practice since 1999 and currently serves as the President of the practice. He completed his fellowship at Wayne State University, Division of Nephrology. He is board certified with the American Board of Internal Medicine, ABIM-Nephrology and Hypertension, "Specialist in Clinical Hypertension, American Society of Hypertension. He serves as Section Chief, Division of Nephrology at Genesys Regional Medical Center and is Medical Director of RRC Dialysis Davison, Davita Dialysis, Ballenger Pointe, Davita Home Program and Hemodialysis Unit in Grand Blanc. "My Sister Has Been Seeing Nephrology & Hypertension Dr. Mohammed For Several Years Now. My Experience With Dr. Mohammed Is That He Takes Much Pride In His Work As A Doctor As He Does With His Patients With Always Making My Sister Feel At Ease And Comfortable And Making Her Feel She's Not Going In This Alone..."
"I have had nothing but a great experience with Nephrology and Hypertension. I have been a patient of Dr. Sahni's for 2 years. He is very knowledgeable and explains all of my issues so that I understand them. The staff is very friendly and helpful. I highly recommend this practice." "I was at the office for my first visit and feel I was treated with compassion and kindness from the entire staff from the moment I walked in the office. Dr. Grewal was kind and took the time to explain my illness to me and his plans for my treatment. " "I have been coming to this office for over 10 years and would recommend this practice to anyone who needs to be treated for their kidneys. The staff is knowledgeable and my physician is excellent. I feel my doctor treats me like he would treat one of his family members!" "Nothing but high praises for this practice!!! "